Obtaining accurate construction bids can be difficult enough, but comparing contractor bids can be even more of a challenge. Home construction contractor bids can vary for many reasons including the simple fact that you are getting construction estimates from multiple contractors. Comparing contractor bids can also be a challenge if the construction bids vary in material and construction methods. 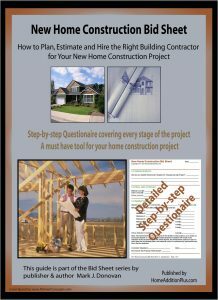 This said, comparing contractor bids can be simplified via a good set of house, or home addition plans, and by following my basic contractor bid checklist. Whether you are building a new custom home, finishing a basement, or simply putting on a deck, provide a complete set of home construction plans and specifications to each contractor bidding on the project. Also, include in the specifications specific features and material you want to see integrated into your home construction project. For example, include specific brand names or styles of doors and windows, house siding type, particular kitchen cabinets, flooring products, appliances, etc. If you don’t know exactly what you want, then spend some time at the local home improvement center picking out items and making note of their prices. By providing contractors with accurate and complete home construction plans, including a list of key building materials, you’ll find the task of comparing contractor bids much easier. In addition, there is less likelihood of missing or forgetting anything in the bidding process. Another litmus test in comparing contractor bids is to look for statements in each contractor bid for contractor licenses and home building organization affiliations. Though not all states require home construction contractor licenses, some of the trades such as Electrical and Plumbing typically do. If the contractor is not licensed or lacks affiliations with regional and national home building organizations you may want to pass on him. When comparing contractor bids check to see how long each home construction contractor has been in business, and how long he has been operating under his current company name. The longer a contractor has been in business, and working under the same company name, the more likely of an accurate and honest contractor bid. If he claims he has been in business for a long time, but he has only been operating under his company name for a short period of time, this is a clear warning sign that he may have had legal problems associated with his previous work. When comparing contractor bids check for insurances and workman compensation. If a home building contractor’s bid lacks information on his personal liability and property damage coverage, as well as workman compensation, ask for copies of these policies/papers. If he cannot present them to you, move on to other contractor bids. If the home construction project is large, and/or involves a general contractor employing subcontractors, obtain their names and licenses. You may want to call them or at least check into their reputations. That last thing you want on your site is a group of subcontractors that do not directly report to you and have nefarious backgrounds. Finally, when evaluating bids, make sure you compare contractor payment schedules. A deposit of 10-15% is common. Anything over this is questionable. By paying too much money up front you lose your leverage in getting your home construction project completed to your satisfaction and timeline. Incremental payments throughout the life of the project are also common, but again, make sure the final payment is not made until all of the work is completed. The final payment should be a sizeable payment to keep the contractor hungry to complete the work. Typically the final payment should be around 10% of the total cost of the project.